Fit-Minded Mama – Helping mamas everywhere become healthier, stronger, and more confident. Helping mamas everywhere become healthier, stronger, and more confident. sugar:shock is my journey to a life free of refined-sugars. After deciding I was 100% addicted to the sweet white stuff, I knew I needed to make a change. These recipes are my creations that allow me to enjoy my favorite foods without the typical refined sugars. Does anyone else get SO tired of breakfast? Ugh. I’ve always cooked for my family – we don’t do cold cereal on the regular – but I get tired of the same old eggs and pancakes. I was super excited to try some pumpkin muffins, because hello, it’s fall! 😉 Everything I make these days will have to include either pumpkin, apple, or pear. Otherwise, I’m just not interested. These muffins are super easy to double up and have extras to freeze or store in the refrigerator for the week. The mix-ins are easy to customize too, so make sure you use something the kids will eat…or let them pick! Preheat oven to 350°F. Grease muffin tins with baking spray or coconut oil. In a large mixing bowl, combine all ingredients except powder, oats, and chocolate chips. Add remaining ingredients and stir until just mixed. Pour scant 1/4 cup batter into each muffin tin. Bake 20 minutes or until knife inserted in center comes out clean. Cool 5-10 minutes. Serve immediately, store in an airtight container, or freeze in airtight freezer bags. Store bought chocolate chips do include refined sugar. If you want to be completely sugar free, order chips online that are sweetened with stevia. Since I’ve been without sugar for so long, foods that would not have been sweet before are now super delicious to me. My family, not so much. 🙂 I did not use maple syrup in my recipe, but my family would have liked these muffins to be a tad sweeter. If your family is used to sugar, I would recommend adding a bit of pure maple to sweeten it up a bit more than the dates will allow. Several days ago I posted a photo to Instagram and Facebook of my groceries for the week. I asked if anyone would be interested in My opinion and tips on how clean eating can actually be more affordable than traditional, over-processed fare. The hr response was a little overwhelming. SO many people wanting to know how I do it that ice put off his post for far too long in hopes of perfecting it. So, let’s just get this out of the way right now. I’m not perfect. Groceries are still expensive. There are foods we buy in bulk that help keep our costs low. And yes, I still buy some of that processed junk occasionally- especially in the summer! In my post I mentioned that this was groceries for a family of six for two weeks, and cost only $150. Please know that we have a freezer full of pork that was raised by family, buckets full of flour we stock once a year, and tons of other staples in the pantry, such as brown rice, quinoa, and oatmeal, which we buy bulk only a few times each year. We do make weekly stops at the store for a few fresh staples such as melons, bananas and salad. If we had to buy these pantry items weekly the cost would change drastically. But what you see in the picture was indeed all we needed for two weeks with a family of six, along with our food storage. With that being said, I’ll give you my grocery list and ideas of how I use each item in our menu. *I was also asked how I can get my kids to eat so much produce, but that’s a topic for another day. Don’t worry…I’ll get it posted soon! Chicken – this was four packages of thighs and legs that were on sale for $.88/lb. I divide them into four meals for our big family and we grill them with various seasonings and a salad on the side. Deli Meat, 1 lb – We don’t buy a lot of deli meat, but when we do it’s the high quality, whole meats, not the pressed, processed stuff. We just watch for specials on our favorites, like this Black Forest ham. Use it for sandwiches or tortilla rolls at lunch, wrap it up inside a lettuce leaf with other veggies, or make hot sandwiches in the oven with your favorite rolls, meat, and cheese. Bacon, 1 pkg – Bacon is also rare. I only buy it as a topping for a big Cobb salad, soups, or other dishes. We never use it as our main protein. Eggs, 5 doz – we eat a LOT of eggs in our house. Breakfast, hard-boiled for a snack, lunch, or to top a salad… We rarely go a day without eggs and probably go through three of these big cases each month. Cottage cheese, the big tub – My kids go through cottage cheese like its candy. I usually buy it to use in some recipe, or as a quick protein for my snacks or lunch on a busy day. Typically, this big run lasts no more than two days once my children discover it. Try it with tomatoes, salt and pepper, or peaches and cinnamon. I’ve also been told it’s amazing with grapefruit but haven’t been quick enough to actually try it. Plain Greek Yogurt – I typically use this in recipes that call for mayo or sometimes sour cream, but it’s not my favorite. Lately I’ve started to enjoy it alone with some vanilla, cinnamon, and stevia. SO delish! Cheese! We enjoy cheese a LOT in our house and use it often to jazz up a boring dish. Feta cheese is a regular salad topping. Cheddar or Monterey Jack are our go-to for most dishes. We grate a bit into a bowl of soup that’s a little too spicy for the kids. Mozzarella cheese is for the lasagna or pizza nights! Sometimes we slice up the cheese with Rotz crackers and ham to make our own lunchables–that is a huge hit with all of the kids! Go-Gurts – No, I don’t recommend them for a healthy eating lifestyle. But we’re being real here, and balance is important. I buy a box very rarely as a treat (bribe) for the kids. They are loaded with sugar so I avoid them as much as I can. Milk – I didn’t buy milk this time but wanted to include my tips because I know it is a staple. We were the family who went through five gallons each week, and it was SO expensive. We have cut back our consumption a LOT after realizing how much extra calories it was adding to our diet. Now we usually have a gallon of 2% in the fridge for an occasional drink or for use in creamy sauces. I also buy unsweetened almond milk which we use in our smoothies, and hot cereals. Olives – We buy olives on the regular to jazz up our pizzas, salads, tacos, or nachos. Whole tomatoes – We by a lot of canned tomatoes for various sauces (spaghetti, pizza, lasagna) and to put into or soups and stews. I learned recently that the best tomatoes are used in the whole canned tomatoes, while the lower quality are chopped up for the diced, stewed, or sauced tomatoes. I put it to the test, and the flavor is SO much better when using whole tomatoes! It adds an extra step of cleansing or mashing the tomatoes but it’s well worth it for the added flavor. Refried Beans – I prefer to make my own, but occasionally I buy a can for a quick meal, usually just 7 layer bean dip. Broth – I’m a pretty picky cook, and broth always taste better than bouillon. I spring for the good Swanson’s broth for the reduced sodium. We use it for soups, stews, sauces, and meats. Coconut oil – yes, it really as good as they say. Coconut oil is a super heathy fat to add to your diet and is even used as a supplement. We use it for cooking, put it in shakes occasionally, and even use it to create healthy candies. Corn tortilla chips – These are pretty much a staple in our house. We use hem for nachos or 7 layer bean dip, or as a topping for tortilla soup. Tortillas, corn and flour – Tortillas are another staple–we love our Mexican food! I can’t convince the family to go whole wheat with tortillas, they just aren’t very good yet. We use flour tortillas for tacos or quesadillas, & corn tortillas for fish tacos. Yeast – I love making our own whole wheat, whole grain bread! I buy a lot of yeast! Whole wheat noodles – I have successfully switched my family to whole wheat noodles! Spaghetti, lasagna, or whatever we come up with, we buy whole wheat. If you’re struggling to convince your family to make the switch, I recommend going 1/2 and -/2 for awhile before switching completely to wheat. Salsa – This is a super good way to spice up any dish, though when I say spice, I really don’t mean it because my family is a bunch of gringos and we buy super mild. We use it on our breakfast burritos, tacos, nachos, etc. Himalayan salt – You may have heard of this or seen the pretty pink salt in the stores. There’s a good reason for its popularity. Basically, all the BAD things you get from salt are the GOOD things you get from Himalayan salt. It has so many health benefits that it is used as a supplement and has been used in the native villages where it originates. I have replaced table salt with this and buy it bulk from my grocery store. Dates – Dates are a fruit that get overlooked a LOT. I have recently discovered them during my sugar-free adventures, and use them to make a TON of treats that call for sugar. Blend it up into a paste and use it for pancakes, breads, desserts, jams, etc. I buy them bulk in my grocery store. I have been craving pulled park sandwiches like crazy this month! Summer for me equals barbecued anything, usually slathered in delicious BBQ sauce. My solution? To create my own, sugar-free and delicious sauce that can be enjoyed all summer long. My seasonal food habits are demanding all things tropical lately. It’s easy to get bored with salads, but this delicious combination of tropical and Asian flavors mixes things up and let’s you have a little fun. The chicken can take a little longer if you’re feeding a large family, so if you have an extra large skillet I would recommend it. You could also make it gluten free by using coconut flour. It is SO delicious though, and it would even make awesome chicken strips for lunch one day. The vinaigrette is still a work in progress. This was tasty, but I’d like to find a way to have a creamy dressing without adding a ton of calories. We’ll see what I come up with. In in the meantime, give this a try and let me know what you think! For the past three weeks, I have sworn off processed sugars completely. Considering the magnitude of the sweet tooth cravings I’ve had for several months, this was no mean feat! For the most part, those cravings are dwindling and the benefits of this change far outweigh the foods I’m missing out on. Soak dates in water for ten minutes while you prepare strawberries. Blend dates with a splash of water until they make a thick paste. Add strawberries, lemon juice, and chia seeds. Blend until well mixed. If you prefer a chunky jam, mash a few extra strawberries and mix into the jam by hand after blending. Pour jam into freezer safe containers. May freeze for up to one year or refrigerate for one week. *A note about the dates: I buy dates from the bulk section of our grocery store they are pitted, but some pits are missed so it’s important to sort through them before you soak. This is a great way to let the kids help! This jam is SO good, it tastes just like the sugar-laden stuff we all grew up on. It doesn’t keep quite as long in the refrigerator (hello, no preservatives!) so use smaller containers. What’s your favorite way to enjoy fresh jam? I have been obsessed with fresh pineapple this spring! I’m loving the fact that they are so affordable and so delicious every time! You could easily use canned pineapple chunks for the topping, just try to find a brand that doesn’t add sugar. First, place roast in a large skillet over medium-high heat and sear on all sides. While roast is cooking, add remaining ingredients to slow cooker and mix well. Remove roast from skillet and place in slow cooker, turning to coat all sides. Cover and cook on low for 6-8 hours or high for 4 hours. Remove roast from slow cooker and shred. Return to cooker and mix with remaining sauce. This week in an activity with the young women from our church, we played a fun “getting to know you” game. We all took turns reading a “This or That” question, and everyone who had the same answer as the one reading it would wrap the yarn around their wrist before passing it on. The main point behind this little exercise was to show us that we are ALL connected in some way. Even if we don’t know someone well, we are connected. We are all brothers and sisters in the gospel, and we can always find something we share with those around us. Together, we came up with a system. We would all stand and slowly walk toward the ball of yarn, spider web in tow. 😜 I’m sure we looked ridiculous. However…every single time, we were able to retrieve the ball without anyone leaving the circle. Working together, we were able to press forward with the exercise. Life can be hard. We have obstacles coming at us from all sides nearly every day. And it’s easy to want to tackle those obstacles alone. After all, by ourselves we only have one schedule, one set of values, one opinion to deal with. But working together makes us so much stronger. Working together, we can all persevere in whatever goals we have in life. This concept applies in so many areas of our lives. I work with my family and my brothers and sisters in the gospel to press on in our efforts to become more Christlike, and to earn our spot in the eternities. After all, without my friends and family, what’s the point of eternal life? It even applies to my business. My team of coaches is constantly working together to press forward, having faith in our mission. We reach out to support those who struggle (much like we reached our yarn-tied wrists forward to give the girl reaching for the yarn a little more slack). And together, we persevere, we change lives…others’ and our own. How about a fitness goal? Have you heard over and over that you need accountability? You need a friend to hold you accountable to your goal or a group to support you. This is how I personally help my clients to reach their goals, by giving them both one-on-one and group support, and it works! Why? Because EVERYTHING is easier when you work together. So, I post the majority of my content on Facebook. It’s my jam. (And if you haven’t already, you should head over and follow my page!) However, I’m discovering that even I have a hard time finding my recipes after more than a day or two have passed. So, I am recommitting to this little old blog, if for no other reason than to create a simpler way of storing the awesomeness that I create in my kitchen. On the good days. However. Doing so has brought up ALL the old issues that had me running away from blogging in the first place. Ugh. I am indeed a perfectionist. Especially in regards to anything that has anything to do with one of my passions. In this case, there are two. Three. See why I ran away? So, to make this work, I’m admitting something to myself, and I’m gonna need y’all to remind me once in awhile if I go overboard. I. Am. Not. A. Food. Blogger. There. I said it. I’m not a food blogger. I’ve always wanted to be one, and in another life I think I could rock it. But for now, I’m busy being mom, wife, coach, and mentor. Food blogging is going to have to wait. So, my recipes are tested, tried and true. My photos will be the best they can be with my top-of-the-line Apple thingamajig. But I will NOT whip out my big ol’ SLR camera, and I will NOT photograph step-by-steps. Whew! Oh, wait…you wanted a recipe? Crap, sorry. Here you go. This was a recipe I created for Superbowl Sunday. You know…otherwise known as Foodie Sunday. Day of the Heart Attack. Bountiful Butter Day. See-How-Much-Junk-We-Can-Consume-Before-the-2nd-Quarter Day. So…here you go. Tangy lemon bars. Give them a try, and let me know what you think! For the crust: place all ingredients except butter in a food processor or quality blender. Pulse until nuts are ground into fine crumbs. Add butter and pulse until mixture resembles coarse meal. Pour mixture into greased 11×7 baking dish. Pat mixture down gently in an even layer. Bake for 23 minutes or until lightly browned. Remove from oven and cool completely. For the filing: In clean processor or blender, add remaining ingredients. Pulse until smooth. Pour mixture over cooked crust; bake at 325* for 30 minutes or until set. Cool completely and refrigerate at least 3 hours. Oh my gosh you guys! I am SO dang excited about this today! Over the last couple of years, as I have been working on my own health and fitness, I have been super sad during the holidays when I feel like I can’t enjoy hot chocolate without a WHOLE lot of guilt. I know how icky the ingredients in those powdered mixes are, but it’s always been such a huge part of the holidays for us that it left me feeling really conflicted. I started experimenting with clean, healthier versions, and I was so shocked at how delicious they were! I honestly would never go back to the powdered hot chocolate after tasting the recipes I finally settled on. I continued to experiment with other flavors, and before I knew it there were more than a dozen recipes I wanted to share. Originally, I had the idea to create an ebook of these recipes to share with my new health and fitness clients, but a friend convinced me it was something I needed to make more widely available. So…I am super excited today to announce the release of my first-ever recipe ebook! This pretty little thing has over 21 recipes for clean holiday drinks, like hot chocolate, apple cider, wassail and eggnog. Some of the new flavors I created are even better than the originals: cranberry vanilla cider, peanut butter hot chocolate, and hot ginger tea…oh my! Click the link below to purchase this ebook and get an instant download. I can’t wait to hear what you think! So…apparently there’s this thing called running. It seems to be all the rage, and everyone’s talking about it. So I thought…hey…I’m gonna go with the “in” crowd. I’m gonna go running! Needless to say…that didn’t last too long. Then I managed to get myself wrapped up in this group of ladies called coaches. Fitness coaches. Me. Voted the most lazy, and I ended up running with the fit crowd. And when you run with the fit crowd…well…you kinda have to run. Okay. That’s an exaggeration. I could overcome the peer pressure of all these hot, fit friends of mine doing the cool thing. I’m good. But then, I have these kids. They are getting kinda big. I’m not really sure how that happened. But all of a sudden they WANT to play sports. Say WHAT? My daughter almost changed her mind on her chosen sport when she discovered that it involved running. Like..she was just gonna perch her pretty little self under the basket and shoot some hoops when her team was done with all that running mumbo-jumbo. The fact that she still wants to play is proof that she’s serious…so I guess she gets to try! But first…we have to teach her how to run. Okay…more exaggeration. But really. This girl puts molasses in January to shame. She moves at her own pace for sure. So we’re going to have to ease her into this. And me. We’re going to have to ease me into it. So I get this brilliant idea. Running! I’m going to start running with my kids this summer! Great idea, right? Ask me in a couple weeks. Wanna join us? 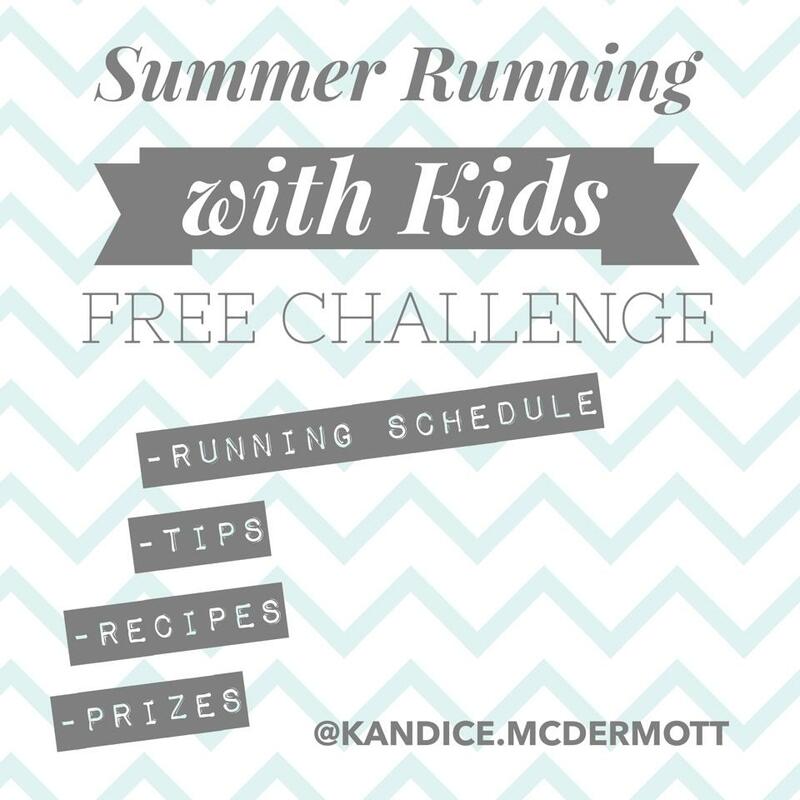 Go to www.tinyurl.com/kandiceschallenge and fill out my regular challenge group application, and just put in the comments that you wanna do the running with kids’ group. We start Monday…let’s do this!! !